Investors across the globe were sent into a panic recently when the Chinese Central Bank devaluated the nation’s currency, the yuan. The U.S. market lost more than 1% of its total value, oil prices fell, and global shares plummeted on news that China decided to make its currency two percent cheaper than it was before. You actually read that right. Headlines raised the prospect of a global currency war, and there were hints in the press that nations might resort to trade barriers, which would slow down global trade in all directions. If you’re following the story, you probably didn’t read that the Chinese yuan, even after the devaluation, was actually more valuable against global currencies than it was a year ago in trade-weighted terms. Nor that China actually intervened in the global markets to make sure the devaluation didn’t go any further in open market trading. The background for the devaluation is China’s slowing economic growth and its recent stock market volatility. The country is on track for a 7% growth rate this year—three times the U.S. rate, but sluggish by recent Chinese standards, and quite possibly unacceptable to the country’s leaders. You probably already know that the Chinese stock market climbed to impossibly high levels earlier this year and then fell just as far in a matter of weeks. 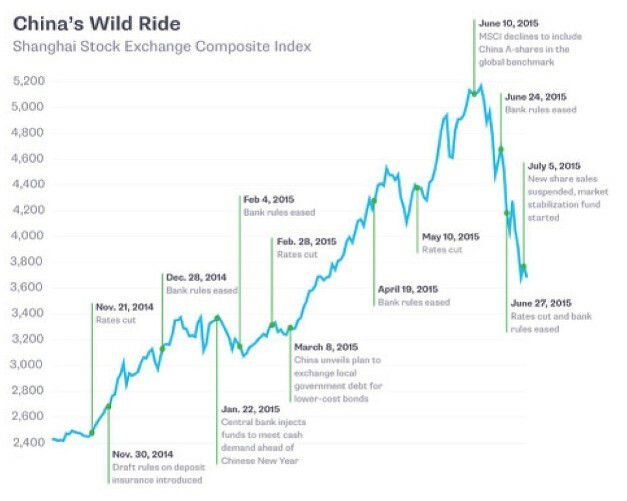 As you can see from the accompanying chart, the Chinese government marched into the chaos with a heavy hand, outlawing short sales, banishing hedge funds to the sidelines, suspending margin calls and even buying stocks directly in an effort to put a floor on prices. The theory was that the devaluation was part of this intervention, since it would make exports cheaper and boost sales, raising profit margins of those companies whose stocks were recently free-falling. A more nuanced view of the situation is that the recent depreciation is a small step to keep the yuan’s value in line with those of its peers, not a dramatic shift in exchange-rate policy or a part of the Great Shanghai Market Panic. Indeed, if you look at the following chart, you can see that China’s percentage of world exports has been steadily growing for this entire century, without any need to add the stimulus of a weaker currency. 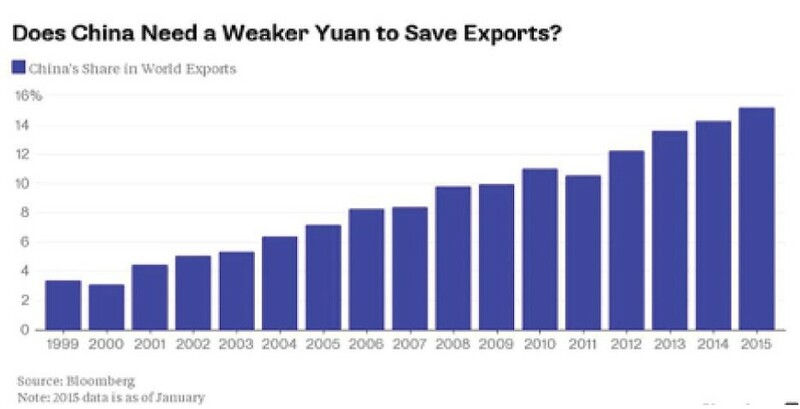 A scarier scenario, which nobody seems to be talking about, is that China’s endgame goal is to make the yuan the reserve currency for global trade—replacing the U.S. dollar. China is already lobbying to join the list of reserve currencies recognized by the International Monetary Fund. The new exchange rate is more in line with basic economic fundamentals, strengthening the argument that the yuan is not under the total control of an interventionist central government. But so long as China imposes strict limits on the amount of its currency that can flow into and out of the country, and attempts to manipulate its own stock market, this will be a difficult argument to make.